Analysis: I am not a big Baldwin supporter and I was a little surprised to see him go in the first round, even if it was late in the round. He has as much potential as any receiver in this class due to his rare combination of size, athletic ability and hands but I have questions about his attitude and effort level and I think he coasted a lot on his athletic ability and natural talent at Pittsburgh. He has a lot of upside and if he gets coached up and improves his route running he could be extremely dangerous and emerge as a beast opposite Dwayne Bowe in a couple of years, but that’s a risky proposition in my opinion. I like Rodney Hudson and he’s a solid guard, but probably not a great fit in a man scheme. He might need to move inside to center for KC. Justin Houston has a lot of pass rushing potential but he is much better with his hand on the ground as a DE than he is standing up and rushing the passer, and he struggles mightily in pass coverage so that hurts him in this scheme. I am not an Allen Bailey fan at all and he is one or two years away from being able to start because of his terrible hand usage. Brown is a solid pick but he is only good in man coverage and even then his upside is limited. Stanzi was a great pick this late as I thought he had the ability to get picked as high as the 3rd round. Powe was a nice pick-up in the 6th because while he is a boom/bust pick the Chiefs have little invested in him with such a late pick and he has definite upside. Analysis: The Colts had only a few picks but they made the most of them. Castonzo is my #1 ranked OT in this class and I do not understand why some are saying he will have to start at RT in the NFL. He is ready to play LT right now, and I expect him to as a rookie before the year is up. Ijalana is a nice pick-up and will either be a RT or an OG on the Colts OL. With their first two picks they immediately upgraded their offensive line to protect Peyton immediately. Then they fill their need for a DT with a very disruptive DT in Drake Nevis to improve their defensive line. And finally Delone Carter is a nice value in round 4 and should have an immediate impact on their RB rotation. Great draft. 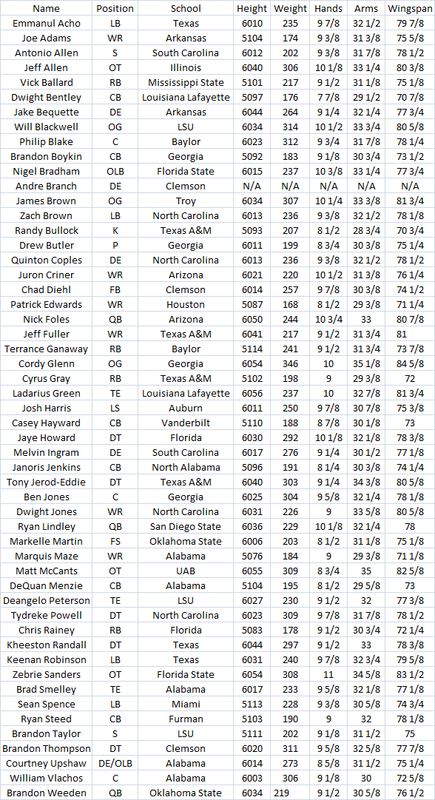 Analysis: The Eagles had a lot of draft picks but I didn’t think they made the most of them. Watkins was a good pick in round one to upgrade their OL, and I like Jarrett a lot in round two also. However, the rest of their picks seemed like depth guys that don’t have a ton of upside as starters, and picking a kicker in round four is tough to get behind even if Henery is a great kicking prospect. Analysis: The Saints made the most of their limited selections as well. Cameron Jordan is a nice pick-up at #24 and should immediately improve their defensive line, and Mark Ingram at #28 is one of the best values in the entire draft. If he stays healthy he is going to be one of the best backs in the league starting this year. Martez Wilson is a freak athlete but his instincts are poor, so while he has upside I wonder how much of that upside the Saints will actually see. Patrick gives the Saints more depth at corner and I really like him, and I like the Romeus pick in round 7. I thought he might go as high as round four or five despite his injury. He has top 50 pick potential when he is healthy, and if he can get healthy and come back slow without being forced in early I think he could be one of the steals of this draft. All reward and no risk, very good pick. Analysis: The Seahawks got pretty good players with their first five picks, I like them all, but they didn’t great value with any of them. Carpenter will be a very nice RT for them starting from day one and I envision him having a long NFL career. Moffitt is actually a solid value in round three and I like that the Seahawks paid attention to the OL early. With Okung, Carpenter and Moffitt they have a really nice, young core of offensive linemen to work with. K.J. Wright is a linebacker that I like a lot and Durham was a guy that I was high on as a late round pick but I was pretty surprised he went as high as he did. Sherman is solid CB or Safety depth, and the rest of the guys strike me as depth and special teams contributors. So they did an alright job, but they could have done better I think. Analysis: The Ravens are typically a very good drafting team but I was not very taken with their draft. I like Jimmy Smith for them at #26, and Torrey Smith provides them with a lot of speed and playmaking ability that they have been sorely lacking recently. I wonder about his body catching though so I wonder how good he is going to be, and I don’t think he will contribute much early on as a rookie. I am not a Jah Reid fan and I haven’t been since the East-West Shrine Game. He looked like a waist bender to me and he is a RT at best, so while he is big I am not a fan of that pick. Doss and Brown are solid pick-ups in rounds four and five, but I like McPhee a lot in a 3-4. I think that is his best scheme, so he will have to bulk up and get stronger to fit in their scheme. I like the Tyrod pick too, he will be a developmental guy behind Flacco like Troy Smith was back in the day. Analysis: This was a tough one for me to grade because I’m a Falcons fan, but overall I liked our draft. It was definitely not what I was expecting so it took some time for me to think it over and decide what I thought of it but overall I like it. Julio was a very nice pick-up for us and with his ceiling and Roddy mentoring him hopefully he will live up to his massive potential, plus he should take a lot of pressure off of Roddy once he gets on the field. Plus, once Roddy starts to decline Julio will be ready to step up as the #1 guy, which is another reason I love this move. Akeem Dent was a pick I was skeptical of early, and it seemed high for him, but he should be a reliable run stopper for us even if he doesn’t have a lot of ability in coverage. Jacquizz Rodgers in round 5 was definitely my favorite pick in the draft for us, and maybe in the entire NFL draft. He is so underrated because of his size that he fell much farther than he should have and I can’t wait to see him in a Falcons uniform. He is EXACTLY what we needed behind Turner at RB. Bosher is a pick I was not a big fan of because I didn’t think he was anything incredibly special as a kicker or as a punter, but I liked the depth additions of Jackson and Matthews because while they won’t contribute immediately they have upside. We gave up far too much for Julio to get an A, but a B+ definitely fits I think. Analysis: I really liked a few of the Bears picks. I’m a big Carimi fan and I think he is going to be a great addition to their offensive line. Hell, he may be their best offensive lineman the second he walks into their training camp facility, that’s how bad their offensive line is. Paea is a nice pick-up in round two also because DT is a serious need for the Bears too, so they got two players who can upgrade two of their serious needs in their first two picks. That’s a good start. Conte is solid safety depth with some upside, and I am a big Enderle fan so I was happy to see him get picked in round 5. Analysis: I like Wilkerson a lot and grabbing him at 30 is a pretty nice value. Ellis has definite upside as a NT so I like that pick and value in round three, and Bilal Powell is a nice power back that should fit their scheme perfectly. Kerley is a very versatile pick-up in round 5, and I really liked their late round picks with McElroy and McKnight. They are both underrated and I was surprised they were both there, but I like both pick-ups for the Jets and I think they will be nice depth for them. Analysis: The Steelers had a very nice draft. Heyward was one of the best values in the draft at #31 overall and I think he will be viewed as one of the steals of the draft in a few years once he is anchoring the Steelers 3-4 defense at DE. Gilbert is a big, powerful RT prospect that will fit their scheme well, and Curtis Brown and Cortez Allen add much needed depth at cornerback and they have definite upside. I don’t think Chris Carter is a perfect fit as a 3-4 OLB but as a situational pass rusher and I think he will be valuable in nickel packages when he can rush with his hand down, which is when I think he is at his best. Baron Batch is a nice pick-up also who has the potential to be a 3rd down back in the NFL. Analysis: The Packers are one of the best teams in the league at drafting and this year was no exception. Getting Sherrod to play LT in their zone blocking scheme was a great pick-up and a good value, and getting Cobb, a guy I graded as a 1st rounder, at #64 overall was a fantastic pick-up and value. Alex Green adds much needed talent to the RB position, and Davon House was a great value at the end of the fourth round when I thought he could have been a 2nd or 3rd round pick. DJ Williams is a pretty good value in round 5 as well and should be a solid #2 TE for them, and the rest of the guys provide nice depth. Lawrence Guy has a lot of upside too so he might end up being a pretty nice pick in the 7th round depending on how he develops. Overall, the Packers had the best draft of anyone in my opinion. That concludes my NFL Draft grades! Look out for my upcoming previews in the coming days! Thanks for reading! Analysis: I thought Houston had a great draft. I am a big fan of J.J. Watt and honestly I am high on the first four selections they bagged in this draft. I think J.J. Watt is a perfect fit for a 3-4 scheme as a DE and the Houston really needed a 3-4 DE, so getting a great player that fills a huge need is about as good as it gets. Brooks Reed gives them a pass rusher off the edge and he is a very good fit for the 3-4 scheme as an OLB. I thought Brandon Harris was a top 25 lock but getting him and then Carmichael in the 4th improves their entire defense. They got better on the defensive line, at the linebacker level and they drastically improved their group of cornerbacks. Between Kareem Jackson, Brandon Harris and Rashad Carmichael they have a lot of young talent at that position now. Keo is more of a back-up/special teams type, and Yates is a career back-up in my opinion, but I think Ozougwu has the potential to be a solid back-up in a 3-4 scheme. Analysis: Ponder was a significant reach at #12 but if he is their quarterback and he pans out as a solid starter then it might be worth the pick, though it may never end up being a good value pick. Ponder has potential and I liked him as a late 1st round pick, but I was surprised by this selection. Rudolph was largely considered the #1 TE in the class but he had first round potential before his injury. It may not have been a huge need but it was still a good value pick. I personally would have picked Rahim Moore here considering their huge need for a safety, but that’s just me. Ballard is a pretty good value in round four. I’m not a big fan of Brandon Burton or DeMarcus Love, but in the 5th and 6th rounds they are merely depth additions with some upside. I like D’Aundre Reed though and he has upside, so grabbing him in the 7th round has the potential to be a steal. Analysis: Detroit may not have had a lot of picks, but they made the most of them. Fairley was a terrific value at #13 overall and should help team with Ndamukong Suh to create a dynamic duo at defensive tackle for the Lions. Titus Young has a lot of speed to threaten down the seam for the Lions and might help draw some attention away from Calvin Johnson eventually. Mikel LeShoure has ability and in the late 2nd round area he was a solid value and should help provide more consistent production than Jahvid Best, allowing him to be a complementary 3rd down back. Analysis: Quinn has a lot of potential as a RE, and Kendricks was my favorite TE in the draft. He was a great pick in the 2nd round, and should help give Bradford another reliable target to throw to. I don’t think Pettis has much upside at all but that’s just me. He also will struggle to separate in the NFL, so I question that pick. Salas strikes me as a reliable slot receiver, and the rest of their picks should be solid depth and special teamers at worst. Analysis: I thought the Dolphins had a pretty bad draft. Selecting Mike Pouncey #15 overall, even higher than Maurkice was selected last year (#17 overall) is absolutely ridiculous in my opinion, especially considering the fact that he is a poor drive blocker and his intangibles aren’t as impressive as Maurkice’s. I also don’t like Thomas much, he runs upright and is not nearly as physical as you might think considering his size. He is a finesse runner in a power back’s body. Gates has a lot of explosiveness because of his elite speed and might be able to provide them with some of what they were looking for from Ted Ginn years ago. Clay should be a pretty good FB for them, and Kearse is a big body that might pan out as a 3-4 NT. Analysis: Gabbert has a lot of upside and he landed in a very good situation in Jacksonville. With David Garrard still entrenched at quarterback he has time to get comfortable in the NFL, and he will need a year or two before he is ready to start. So landing on a team with a quarterback ready to start for another year or two is an ideal situation for him. I am very high on Will Rackley as well, and I think he will be a good addition to their offensive line. Cecil Shorts III has some potential as a slot receiver also. 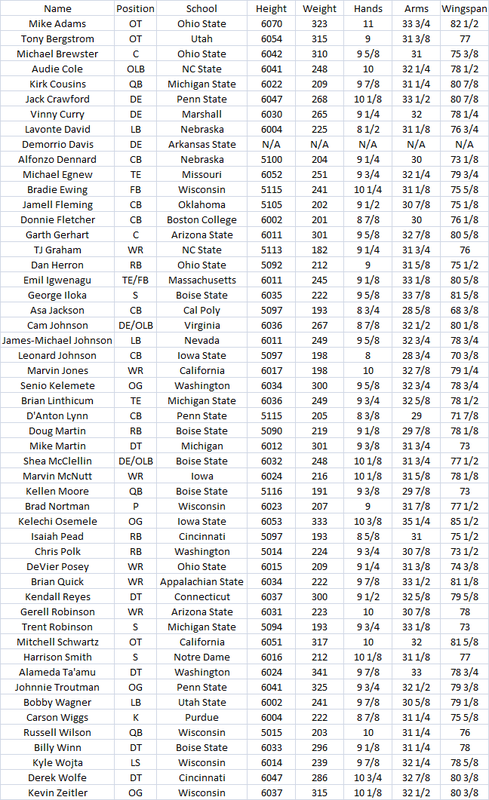 Analysis: Oakland again had a sub-par draft in my opinion. Wisniewski has good potential as a C, but Van Dyke was severely overdrafted just because of his speed. I could not believe he went in the 3rd round. I would have had a hard time justifying selecting him in the 7th. Barksdale is a solid OT but he will have to play RT. Chekwa is another speed demon, same with Taiwan Jones and Denarius Moore, but I wonder how significant their impact will be. Analysis: I thought Solder was overdrafted at #17 overall so it will be interesting to see if that pick pans out for the Patriots. I thought Dowling at #33 might be a bit high, but I really like Vereen and Ridley and they are bringing a lot of talent to the Patriots backfield. Mallett in round 3 was a very interesting pick in round 3 but he obviously has a ton of upside with limited risk. Cannon in round 5 is a great pick-up despite some of his health concerns as well. 1 – Corey Liuget, DE, Illinois 8. Analysis: Liuget should be a good pick at 3-4 DE and he definitely has upside. I’m not a big Gilchrist fan but he definitely has a nice combination of size and speed. Vincent Brown is one of my favorite picks in the 3rd round and I think he will have a more significant impact than people expect. He’s a very good route runner with great hands, so I really liked that pick. I was surprised Todman fell to the 6th, but with his speed and potential that could be a nice upside pick in the future. Analysis: The Giants stayed patient and ended up with a significant upgrade to the cornerback position with Amukamara, and they got a very talented defensive tackle in Marvin Austin in round two. He has a ton of potential but I am not sure he will ever reach it because of his attitude and work ethic. Jernigan is going to be a very dynamic slot receiver for the Giants in my opinion. Brewer has potential as a RT, Jones was a great value in round six. The rest are solid depth, though Sash has some upside. Analysis: Clayborn and Bowers were two interesting additions to a defensive line with a couple of very talented defensive tackles. Foster has a lot of potential as well and getting him in round three was a great value in my opinion. Stocker has good potential too and he is a well-rounded TE. Black has great intangibles and while he doesn’t have elite size and athleticism he could very well plug the hole the Bucs have had at safety. Thanks for reading! One more round of draft grades will be up in the next day or two and then I’ll have some names to look out for next year in two posts!